Sweden, formally the Kingdom of Sweden, is a Scandinavian Nordic country in Northern Europe. It borders Norway to the west and north and Finland to the east, and is connected to Denmark in the southwest by a bridge-tunnel across the Öresund, a strait at the Swedish-Danish border. At 450,295 square kilometres (173,860 sq mi), Sweden is the largest country in Northern Europe, the third-largest country in the European Union and the fifth largest country in Europe by area. 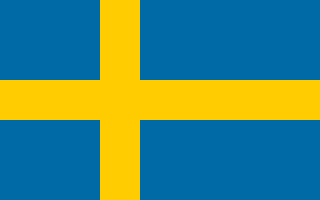 Sweden has a total population of 10.2 million of which 2.4 million has a foreign background. It has a low population density of 22 inhabitants per square kilometre (57/sq mi). The highest concentration is in the southern half of the country. The Lech is a river in Austria and Germany. It is a right tributary of the Danube 255 kilometres (158 mi) in length with a drainage basin of 3,919 square kilometres (1,513 sq mi). Its source is located in the Austrian state of Vorarlberg, where the river rises from lake Formarinsee in the Alps at an altitude of 1,870 metres (6,120 ft). It flows in a north-north-easterly direction and crosses the German border, forming the Lechfall, a 12-metre-high (39 ft) waterfall; afterwards the river enters a narrow gorge. Leaving the Alps, it enters the plains of the Allgäu at Füssen at an elevation of 790 metres (2,580 ft) in the German state of Bavaria, where it used to be the location of the boundary with Swabia. The river runs through the city of Füssen and through the Forggensee, a man-made lake which is drained in winter. Here, it forms rapids and a waterfall. Johann Reichsgraf von Aldringen was an Austrian soldier active before and during the Thirty Years' War. He was born in Luxembourg City in the Grand Duchy of Luxembourg, and after travelling as a nobleman's page in France, Italy and the Netherlands, he went to the University of Paris. Bavaria, officially the Free State of Bavaria, is a landlocked federal state of Germany, occupying its southeastern corner. With an area of 70,550.19 square kilometres, Bavaria is the largest German state by land area. 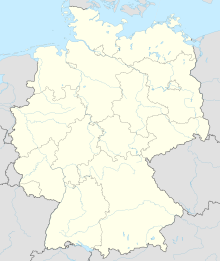 Its territory comprises roughly a fifth of the total land area of Germany. With 13 million inhabitants, it is Germany's second-most-populous state after North Rhine-Westphalia. Bavaria's main cities are Munich and Nuremberg. The Battle of the Alte Veste was a significant battle of the Thirty Years' War. The Battle of Lützen was one of the most important battles of the Thirty Years' War. Johann Tserclaes, Count of Tilly was a field marshal who commanded the Catholic League's forces in the Thirty Years' War. 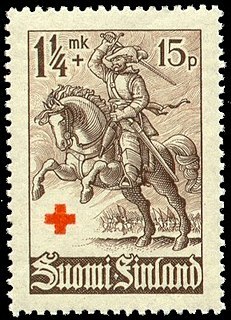 From 1620–31, he had an unmatched and demoralizing string of important victories against the Protestants, including White Mountain, Wimpfen, Höchst, Stadtlohn and the Conquest of the Palatinate. He destroyed a Danish army at Lutter and sacked the Protestant city of Magdeburg, which caused the death of some 20,000 of the cities inhabitants, both defenders and non-combatants, out of a total population of 25,000. Tilly was then crushed at Breitenfeld in 1631 by the Swedish army of King Gustavus Adolphus. A Swedish cannonball took his life at Rain. 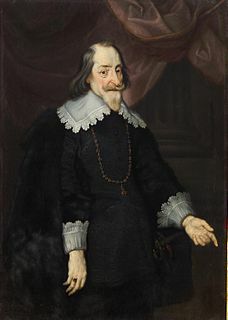 Along with Duke Albrecht von Wallenstein of Friedland and Mecklenburg, he was one of two chief commanders of the Holy Roman Empire’s forces in the first half of the war. The Battle of Breitenfeld or First Battle of Breitenfeld, was fought at a crossroads near Breitenfeld approximately 8 km north-west of the walled city of Leipzig on September 17, or September 7, 1631. It was the Protestants’ first major victory of the Thirty Years War. The Second Battle of Breitenfeld, also known as the First Battle of Leipzig, took place on 23 October 1642 at Breitenfeld, some 7.5 kilometres (4.7 mi) north-east of Leipzig, Germany, during the Thirty Years' War. The battle was a decisive victory for the Swedish army under the command of Field Marshal Lennart Torstenson over an Imperial Army of the Holy Roman Empire under the command of Archduke Leopold Wilhelm of Austria and his deputy, Prince-General Ottavio Piccolomini, Duke of Amalfi. Hakkapeliitta is a historiographical term used for a Finnish light cavalryman in the service of King Gustavus Adolphus of Sweden during the Thirty Years' War. Hakkapeliitta is a 19th-century Finnish modification of a contemporary name given by foreigners in the Holy Roman Empire and variously spelled as Hackapelit, Hackapelite, Hackapell, Haccapelit, or Haccapelite. These terms were based on a Finnish battle cry hakkaa päälle, commonly translated as "Cut them down!" Torsten Stålhandske – Swedish for "Torsten Steelglove", sometimes written "Stålhansch" in the Swedish of the times, and referred to in German literature as Torsten Staalhansch, was a Finnish officer in the Swedish army during the Thirty Years' War. 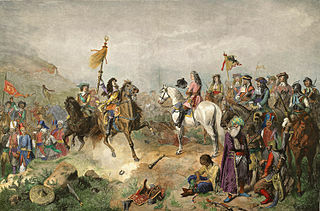 The Second Battle of Mohács, also known as the Battle of Harsány Mountain, was fought on 12 August 1687 between the forces of Ottoman Sultan Mehmed IV, commanded by the Grand-Vizier Sari Süleyman Paşa, and the forces of Holy Roman Emperor Leopold I, commanded by Charles of Lorraine. The result was a crushing defeat for the Ottomans. Rain is a town in the Donau-Ries district, in Bavaria, Germany. It is situated on the river Lech, close to its confluence with the Danube, 11 km east of Donauwörth. The Polish–Swedish War of 1626–1629 was the fourth stage in a series of conflicts between Sweden and Poland fought in the 17th century. It began in 1626 and ended four years later with the Truce of Altmark and later at Stuhmsdorf with the Treaty of Stuhmsdorf. Lennart Torstensson, Count of Ortala, Baron of Virestad, was a Swedish Field Marshal and military engineer. The Battle of Dirschau took place in the summer of 1627 and was one of the battles of the Polish–Swedish War (1626–29). The Polish forces led by Crown Field Hetman Stanisław Koniecpolski met with troops commanded by Swedish King Gustavus Adolphus of Sweden. Gustavus Adolphus was wounded in the battle, which ended inconclusively. Fighting in Prussia ended in a stalemate for that year, and would not resume until 1628. From 1611 to 1721, Sweden was a European great power, becoming a dominant faction in the quest for control of the Baltic Sea and a formidable military power. During this period, known as Stormaktstiden, the Swedish Empire held a territory more than twice the size of its modern borders and one of the most successful military forces at the time, proving itself on numerous occasions on battlefields such as Wallhof, Narva and Düna. The military of the Swedish empire is commonly recognized only as the Caroleans, which were in fact not in service until the late 17th century under Karl XI and his successor. 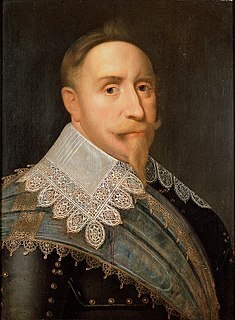 The Swedish Empire and its modern military force was founded by Gustavus Adolphus, who inherited the throne in 1611 at age 17. He immediately reformed the common European military based on mercenaries to a professional national army. However, before completing his vision of conquering the Holy Roman Empire, the warrior king was killed in action in 1632. His daughter and successor did little to improve Sweden's military position and abdicated early, providing the Swedish Empire with a more warlike ruler. Karl X Gustav was only king for 5 years, but conquered large amounts of territory that still belong to Sweden today. His son Karl XI would further strengthen the army by introducing the Caroleans, which were also used by Karl XII in the Great Northern War. The Blue Regiment or the Blue Brigade was an infantry regiment in the service of Gustav II Adolph during his campaigns in Germany in the Thirty Year's War. A large portion of the regiment was made up of German mercenaries, who were a common phenomenon on both sides. The regiment's name is derived from the blue colored uniforms worn by the soldiers.